Antoinette Parfait Statement Harness Bib necklace choker combination Vintage brass Divine! Announcement A HUGE shout out and thank you for everyone who was so patient the last months. Everything is shipping out on time! Armor Rings Featured on The View. All of my rings, chokers, headdresses, headpieces, are handmade in the USA by myself alone. New exclusive items will be added weekly! Most Items ship in 7 to 10 business days. You can also click your etsy invoice to see your "will ship by" date. I strive to make a great product and give great service. Have an issue? Let me know, as I care very much about your order and will always go above and beyond to help out my customers. Praise? Problem? EMAIL ME! <3 I'm really nice and I care about your order! and many other TV shows, films, celebrities, bands, etc yeah! + Raven Eve Jewelry Copyright © 1999 - 2016 All works are property of Raven eve Jewelry LLC / Emily Sullivan. Do not use anything from this site without express written legal permission. CAUTION! All Raven Eve products are not intended for use by children 14 or under, contain small parts that could be potential choking hazards, and may be harmful if swallowed. A HUGE shout out and thank you for everyone who was so patient the last months. Everything is shipping out on time! Armor Rings Featured on The View. All of my rings, chokers, headdresses, headpieces, are handmade in the USA by myself alone. New exclusive items will be added weekly! Most Items ship in 7 to 10 business days. You can also click your etsy invoice to see your "will ship by" date. I strive to make a great product and give great service. Have an issue? Let me know, as I care very much about your order and will always go above and beyond to help out my customers. Praise? Problem? EMAIL ME! <3 I'm really nice and I care about your order! 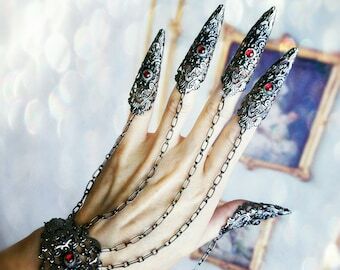 Gothic Claw Rings Nail armor Bracelet Set Made in your Custom Color choice! Retro 90s Ankh Tattoo Choker with Gift Box One Size fits all trendy and cute! 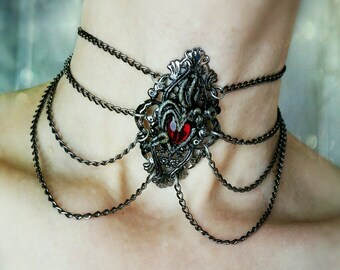 It’s beautiful & I can’t wait to wear it to the Vampire Ball this month in Las Vegas! 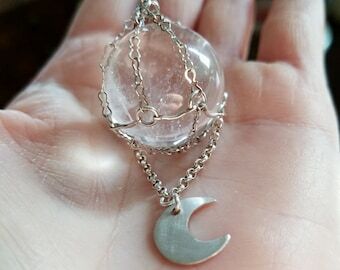 One of a kind Crystal Ball Spirit Stone pendants added!!! In opal or jet black glass. Raven Eve Jewelry, Handmade in the USA! My Armor Rings, Midi Rings, Ear Cuffs, Headdresses, Sterling Silver Rings, etc, are all handmade in the USA by me! My rings were featured on The View / Whoopi's Favorite Things segment in November of 2013. Because most things are made to order, most Items ship in 7 to 10 business days, unless otherwise noted in the listing. My work has been worn by such celebrities as Whoopi Goldberg,Kat Von D, Courtney Love, Margaret Cho, and many more! My jewelry has also been worn and featured in several major motion pictures, music videos, TV shows, magazines, books, and blogs! I studied metal smithing and glass lamp working in the US and abroad in Europe. 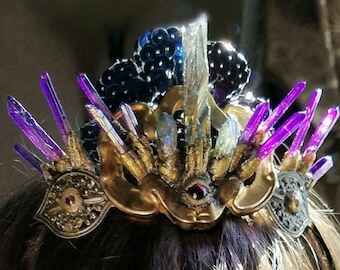 I have designed jewelry for Raven Eve for 15 years but have been designing and selling my work since the 1980's. I have taught jewelry design and construction over the years, but quit to focus on my own designs in 2006. Custom and Personalized orders are final sale. All items come shipped in a gift box. Do all of your handmade items look exactly alike? All items are as stated very accurately and I strive to offer the finest quality. Please note that items are handmade and some variation in the materials used is to be expected. Some items are OOAK, so what you see in the pic is what you get, minus color variation due to monitors,etc.